As part of my residence with the Champaign-Urbana Symphony Orchestra, I’ve been giving presentations at several organizations in the Champaign-Urbana region. 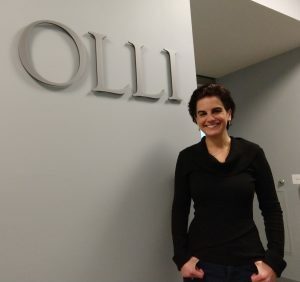 On Wednesday, I gave my “How does a composer compose instrumental music?” lecture/demonstration at the Osher Lifelong Learning Institute (OLLI for short), which aims to demystify the composing process for general audiences. I took the attendees through the process of how I composed Bohemian Café for woodwind quintet and double bass, starting with studying videos of street musicians in Prague, then looking at early pencil sketches & how I moved the material into a computer software program, and ending with Fifth House Ensemble‘s premiere of the piece (which you can watch online by clicking here). The OLLI participants were a great and inquisitive audience! 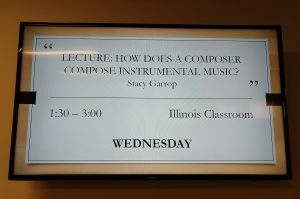 This presentation is the second in my “How does a composer compose?” series, as I previously gave a presentation last spring at OLLI on writing choral music.